Lichtwer Pharma are the German manufacturer of Kwai, one of the world’s best-selling and most-studied garlic supplements. (The company has sponsored much of the research on garlic and cholesterol. 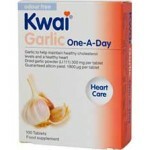 )Kwai Garlic is the most researched garlic supplement in the world, supported by extensive scientific trials and studies. This research shows that garlic can help maintain a healthy heart and circulation. Each tablet is also coated 60 times to be odour free. Key point: odour free convenient supplement of processed garlic tablet.